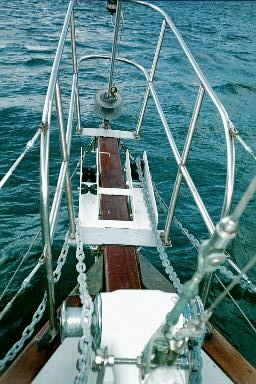 Finally finished bowsprit replacement about the time you made your post. We used laminated tava, a local hardwood, glued with epoxy in a press in Western Samoa and efelele (Samoan iron wood) for the sampson posts. The yard also put the basic taper in the sprit with a large band saw. Similar to Greg, I made the initial cuts for the cone tapered cranse iron (as opposed to straight on the original) with a circular saw, but then cleared it square, then round with a chisel. Once round, I put the taper in with a spoke shave and did the final shaping with a 40 grit, 4×24 (100mmx610) sanding belt torn to form a strop. I replaced the cranse iron with a bronze one from Newfound Metals. The old sprit had rotted, one end to the other, along all the glue lam joints. I turned the sprit from the original so that the glue lam joints are now parrall to the water. I also did not bolt it thru the deck, once again opinion was the flexing of the strut at the bolts is what led to the failure. I made a combination gammon iron/staysail stay bracket to keep the ‘sprit from floating up and a wedge under from going down too far. Once again, under the belief that the holes cause the failure, instead of drilling into the ‘sprit, I made ‘u-clamps’ (stainless for the anchor rollers, port and starboard, aluminium for the pulpit, then bolted the whole thing together (tava is harder than oak and very fine grained). Efelele is extremely hard, but is prone to checking, so I made caps for the exposed end grain from a door brass kick plate. Finished everything with 6 layers of varnish (cosmetically, tava is great looking wood, finished clear it has iridesent tones when viewed at an angle.